Over 500 people attended the DeVoe Event, held on Oct. 26th in downtown Indianapolis. “This gathering honored the legacy of the late Mr. James DeVoe while pointing toward a bright future of innovation in business, education and improving business practice,” said Dr. Kneeland C. Brown, the dean of the DeVoe School of Business. Jim DeVoe, a former Grant County resident, owned DeVoe Chevrolet and founded the Indianapolis-based J.D.Byrider, one of the largest used car dealership networks in the United States. The DeVoe family’s generous gift to Indiana Wesleyan led to the university’s creation and naming of the DeVoe School of Business in 2013. The highlight of the day was the luncheon where John D. Beckett, chairman of the R.W. Beckett Corporation and author of the book “Loving Monday: Succeeding in Business Without Selling Your Soul,” was the featured presenter. A common theme between Beckett and Indiana Wesleyan University President Dr. David Wright is that the ideal of service to neighbors can exist in the workplace. That is also something that DeVoe put into practice in his own company. The master of ceremonies for the event was Chuck Lofton, an Indianapolis area broadcast professional. Since Eyewitness New Sunrise debuted in 1985 on WTHR, central Indiana Viewers have counted on Lofton to provide their morning weather forecast. Lofton, named the 2007 National Broadcaster of the Year by the National Weather Association, is a frequent speaker to churches, schools and civic organizations. John D. Beckett is Chairman of R.W. Beckett Corporation, a global leader in the manufacturing and sales of engineering components for residential and commercial heating. The company, with its affiliates, currently has sales exceeding $100 million, with more than 600 employees. He has been named manufacturing “Entrepreneur of the Year” by Ernst & Young (2003). 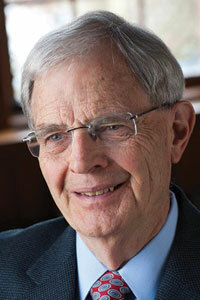 Mr. Beckett serves on the board of Cru (Campus Crusade for Christ, International). He has been named “Christian Businessman of the Year” by the Christian Broadcasting Network (1999). Mastering Monday: A Practical Guide to Integrating Faith and Work.